Citibank Malaysia offers a choice of credit cards to fit the needs of your lifestyle. With so many credit cards being offered, it is important to get a credit card which best suits your needs. Please compare the different rates and features of all credit cards before making your decision. RM 1 = 1 rewards points for all transaction except for petrol station purchases. Points never expire. Free one-way transfer to KLIA. CitiBank helps you to book your air tickets, travel packages and hotel accomodation at no extra cost. Competitive deals on airline tickets and travel packages. Free Travel insurance of RM500,000 and airline tickets delivered to your doorstep when you charge your tickets to your Gold Card. Discounts of up to 50% at over 24,000 establishments, worldwide. Citibank will helps you to organize flowers and gift delivery for you at discount of up to 20% within Malaysia. The Citibank Choice Credit Card is your reward card that now gives you the freedom to make the purchases you’ve always wanted, while enjoying the peace of mind that financial control brings you. And this is the only life time annual fee waived credit card from Citibank with the condition of monthly at least 2 times any amount transaction. With travel discount, shopping discount, restaurant deals, dinner deals, golf discount etc, the Citibank Clear Credit Card is virtually your ticket to the high life. Discounts up to 50% and preferential treatment at over 1,000 local and over 24,000 international establishment for dining, shopping, golfing & travel. Conversion For Overseas Transactions Determined by MasterCard International + an administrative cost of 1%. This entry was posted in Banking & Finance and tagged Choice, CitiBank, Clear, Credit Cards, Credit Shield Plus, Gold, Master, MasterCard, Never expire reward points, Platinum on February 20, 2010 by RMvalues. 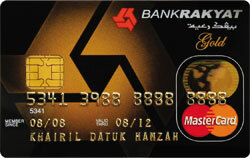 This entry was posted in Banking & Finance and tagged Bank Rakyat, Classic, credit card, Gold, Master on February 4, 2010 by RMvalues. Complimentary Group Family Takaful coverage (up to RM100,000) and funeral expenses of RM5,000 for principal cardholders for the whole period of contract. This entry was posted in Banking & Finance and tagged Bank Islam, Cobrand, credit card, Master, MBSB-Bank Islam Credit Card on February 3, 2010 by RMvalues.